If you’re a fan of jerky, buying it commercially can become a bit expensive and the product is sure to have some additives and preservatives added. It’s not hard to make a decent sized batch at home to save money but using the right equipment is essential for food safety as well as turning out tasty and nice textured jerky. Dehydrating foods can be done in an oven with the door left open a crack but it has to be done at low temperatures for a long period of time, so the oven is not ideal for this purpose. You should instead use a food dehydrator. If you make jerky at home then you can dehydrate lots of other foods as well in this appliance. Fruits, herbs, vegetables and fruit rolls are very easy to do and are quicker and safer to dehydrate, so there are any number of models that are good enough for those. For meat and poultry, however, you must be pickier because if they are not heated to 160°F for meat for about 2 hours before dehydrating at a lower temperature for the remaining time, you run the risk of E.coli or salmonella contamination. The temperature should also remain at a constant 130-140°F for about 6 hours after that in order to fully remove any moisture and to prevent it from spoiling. The USDA website explains everything you need to know about safely dehydrating food at home. The best dehydrator for jerky should allow you to do both these things and should let you control the temperature yourself rather than come with a factory preset only. If you don’t want a dedicated dehydrator but want to make meat jerky only, then the Oster Countertop French Door Oven has a “dehydrate” option. It doesn’t go low enough for fruits and veggies but meats will work well. If you have the budget and want to dehydrate fruits, vegetables and meat and fish, then consider the Breville BOV900BSS Smart Air Oven. It does a whole lot more than just bake, broil and toast. We’ll review 4 top rated dehydrators that are good for jerky but you could also check out others available on Amazon. If you are looking for a food dehydrator that is easy to use and features tons of drying space, look no further than the Excalibur 3900B 9 Tray Deluxe Dehydrator or the Excalibur 3926TB model. The Excalibur 3900B does not include a timer but you can plug it into your own timer. The Excalibur 3926TB model includes its own 26 hour timer but comes at a higher price. However, even with a timer, it is advisable to use it only as a reminder to check on the dehydrating process and not as a signal to switch the unit off, as air temperature and humidity affects how long it takes. There are no other differences between these two models. This appliance comes equipped with nine square trays and a whopping 15 square feet of dehydration space, so dehydration is fast and you can do large quantities at a time. You can reasonably do about 4-5 lbs of meat at a time. Each tray is also lined with flexible mesh tray inserts, so you don’t have to worry about herbs, diced fruits, flowers or vegetables falling onto any trays that are below as they are being dried. They also prevent food from sticking to the trays, making cleanup very easy. The trays are removable so you can have extra height if you need to reheat bulkier foods in it. The fan is 7” and the power rating is 600W. The Excalibur 3900B and 3926TB feature an adjustable thermostat with a temperature control range with settings from 105 to 165 degrees, so it is completely safe for drying any type of meat you’d like to turn into jerky. The thermostat, fan and heating element can be found on the back of the dehydrator to draw in cool air, heat it and then recirculate it all over each tray, meaning you won’t have to rotate the trays while your food is drying. It uses a patented technology so that the temperature that you set is maintained within a small range but fluctuates evenly within it. At the higher end, moisture is constantly removed from the surface, while at the lower end moisture from within rises out to the surface. With this set up the food turns out tasty and chewy but you can be assured that the end product is safe to eat. There are a couple of drawbacks to this dehydrator. The trays are large and you may find they don’t easily fit flat into your kitchen sink for hand cleaning, depending upon the size of your sink. You may also find the fan is too loud for your taste. Despite these minor nuisances it is the best food dehydrator for jerky and perfect for use in a garage or outdoors. If a timer on your food dehydrator is important to you, consider the Nesco 1000-watt Gardenmaster Food Dehydrator, whose digital timer can be programmed for up to 48 hrs so you can set it and forget it. The Nesco FD-1040 is roomier than the Excalibur and can hold up to 20 15.5 inch trays and features 20 square feet of drying space even though it comes equipped with just 4 trays. Its patented drying system forces air from the top where the heating element and 4.5 inch fan is, down the walls of the unit and across each tray towards the center for even heating. Drying pressure will adjust automatically as you add additional trays. The FD-1040 has an opaque exterior which blocks light harmful to the dehydration process. It has an adjustable cooking temperature range of between 90 and 160 degrees and a powerful 2,400 RPM fan. You also get a No-Spill fruit roll sheet that has lips to prevent drying liquid from spilling, a flexible screen for drying small items like herbs, and a jerky spice packet. The trays can be cleaned in the dishwasher but with the heat drying cycle off. 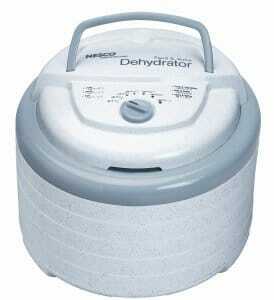 No dehydrator is perfect, and neither is the Nesco FD-1040. Keep in mind that it comes equipped with only four trays, which are simply not enough to handle even the simplest food drying needs. It can also make strange noises at regular intervals, which can be annoying to some people. The Presto 06301 Dehydro is a fractionally less expensive food dehydrator than the models listed above but does not sacrifice the convenience of either a digital temperature control or digital timer. It comes equipped with six trays but can be expanded to 12 for additional drying capacity. You can also “nest” the trays together to save on space when you’re not using them. You’ll find that this dehydrator can dry a variety of different products and has a temperature range of 90 to 165 degrees. The product’s fan and heating element are mounted on the bottom, allowing for even air flow and a quick drying time. And, if you like to monitor what you’re drying as the dehydration process takes place, this is the product for you. It features a see-through cover so you can keep an eye on the entire process. Cleanup is a snap with this model as well, since the trays and cover are dishwasher safe. You also get two fruit roll sheets, two non-stick mesh sheets and jerky spice and cure samples. Like several of the other dehydrators listed above, you may find that the fan on the Preso 0630l is noisy. Its trays are also relatively shallow, so you should closely monitor what you are dehydrating while using this product. You might find that a nine tray dehydrator like the Excalibur or the Nesco Gardenmaster above are either too small or too big for your food drying needs or that they are just over your budget. If you do, take a look at the Nesco Snackmaster Pro Food Dehydrator, which comes equipped with five BPA-free trays, but can handle a total of 12 trays, which are sold separately. With an adjustable thermostat, a cooking range of between 95 and 160 degrees and 600W of power, you’ll find you can dry everything from meat to herbs to flowers in this dehydrator. It features a top-mounted fan that forces air down and across the trays for quick and even drying so there’s no need to rotate trays. Its opaque exterior also helps block harmful outside light from interfering with the dehydration process, keeping your foods tasting like they should. You get two mesh sheets, two solid sheets and three jerky spice packets, so you can do different foods on different trays and flavors won’t mix. It even comes with a recipe book so you can confidently dehydrate foods you’ve never dried out before. If you are looking for a dehydrator with a timer, the Nesco 75-A may not be for you, since it is not equipped with one. However, as mentioned above, a timer should only be used to remind you to check the doneness of the food and not to switch the appliance off because dehydrating times can vary according to outside temperature and humidity. Be careful about putting the trays in your dishwasher, as they are not completely dishwasher safe and the heat from you dishwasher’s drying cycle could warp them. Instead, use the “air dry” option. If you think that a dehydrator is not for you, you could try using a convection oven to do the job. After you heat the meat at a minimum of 165F, lower the heat further and crank open the door just a bit. Leave it on for several hours until the food is completely dried. There are other methods of preserving food at home, like canning with pressure canners and freezing vacuum packed parcels of food.